Academic publishing is the subfield of publishing which distributes academic research and scholarship. Most academic work is published in journal article, book or thesis form. Much, though not all, academic publishing relies on some form of peer review or editorial refereeing to qualify texts for publication. Most established academic disciplines have their own journals and other outlets for publication, though many academic journals are somewhat interdisciplinary and publish work from several distinct fields or subfields. The kinds of publications that are accepted as contributions of knowledge or research vary greatly between fields, as do review and publication processes. Academic publishing is undergoing major changes as it transitions from print to electronic formats of publication; publications on the internet allow for easier access from home and search engines help a user find articles faster. Since the early 1990s, licensing of electronic resources, particularly journals, has been very common. Journal aggregator services combine hundreds to thousands of journals into a package, the access to which they sell to libraries and institutions. Recently, open access to academic research and scholarship via the Internet is becoming increasingly popular. There are two main forms of open access: open access publishing, in which the articles or the whole journal is freely available from the time of publication; and self-archiving, where authors make a copy of their own work freely available on the web. STM Publishing is a frequently-used abbreviation for academic publications in science, technology, and medicine. Among the earliest research journals was the Philosophical Transactions of the Royal Society in the seventeenth century. At that time, the act of publishing academic inquiry was controversial and widely ridiculed. It was not at all unusual for a new discovery to be announced as an anagram, reserving priority for the discoverer, but indecipherable for anyone not in on the secret: both Isaac Newton and Leibniz used this approach. However, this method did not work well. Robert K. Merton, a sociologist, found that 92 percent of cases of simultaneous discovery in the seventeenth century ended in dispute. The number of disputes dropped to 72 percent in the eighteenth century, 59 percent by the latter half of the nineteenth century, and 33 percent by the first half of the twentieth century. The decline in contested claims for priority in research discoveries can be credited to the increasing acceptance of the publication of papers in modern academic journals. The Philosophical Transactions of the Royal Society, or Phil. Trans., is a scientific journal published by the Royal Society. Begun in 1665, it is the oldest scientific journal printed in the English-speaking world and the second oldest in the world, after the French Journal des sçavans. It is still published, making it the world's longest running scientific journal. The use of the word "philosophical" in the title derives from the phrase "natural philosophy," which was the equivalent of what we would now generically call "science." 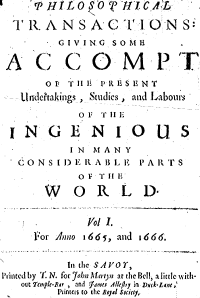 The first issue, dated March 6, 1665, was edited and published by the society's secretary, Henry Oldenburg, some six years after the Royal Society had been founded. Over the centuries, many important scientific discoveries have been published in the Philosophical Transactions. Famous contributing authors include Isaac Newton, Michael Faraday and Charles Darwin. In 1672, the journal published Newton's first paper New Theory about Light and Colours, which can be seen as the beginning of his public scientific career. In academic publishing, a paper is an academic work that is usually published in an academic journal. It contains original research results or reviews existing results. Such a paper, also called an article, usually undergoes a process of peer review by one or more referees (who are academics in the same field) in order to check that the content of the paper is suitable for publication in the journal. A paper may undergo a series of reviews, edits and re-submissions before finally being accepted or rejected for publication. This process typically takes several months. Also, there is often a delay of many months (or in some subjects, over a year) before publication, particularly for the most popular journals where the number of acceptable articles outnumbers the space for printing. Due to this, many academics offer a 'pre-print' copy of their paper for free download from their personal or institutional website. Some journals, particularly newer ones, are now published in electronic form only. Paper journals are now generally made available in electronic form as well, both to individual subscribers and to libraries. Almost always these electronic versions are available to subscribers immediately upon publication of the paper version, or even before; sometimes they are also made available to non-subscribers after an embargo of two to twenty-four months, put in place in order to protect against loss of subscriptions. Journals having this delayed availability are generally called delayed open access journals. Peer review is a central concept for most academic publishing; other scholars in a field must find a work sufficiently high in quality for it to merit publication. The process also guards against plagiarism. Failures in peer review are sometimes scandalous (the Sokal Affair is arguably one example, though this controversy also involved many other issues). The production process, controlled by a production editor or publisher, then takes an article through copy editing, typesetting, inclusion in a specific issue of a journal, and then printing and online publication. Copy editing seeks to ensure that an article conforms to the journal's house style, that all of the referencing and labelling is correct, and that there are no spelling or grammatical errors. Typesetting deals with the appearance of the article—layouts, fonts, headings etc., both for print and online publication. In much of the twentieth century, such articles were photographed for printing into proceedings and journals, and this stage were known as "camera ready" copy. With modern digital submission in formats such as PDF, this photographing step is no longer necessary, though the term is still sometimes used. The author will review and correct proofs at one or more stages in the production process. The proof correction cycle has historically been labour-intensive as handwritten comments by authors and editors are manually transcribed by a proof reader onto a clean version of the proof. In recent years, this process has been streamlined by the introduction of e-annotations in Microsoft Word, Adobe Acrobat, and other program, but it still remains a time-consuming and error-prone process. In academic publishing, each scholarly journal uses a specific format for references. Among the most common types of formatting are the APA, CMS, and MLA styles. There are three important aspects for documenting sources. First, it also helps writers to give credits to other people and avoid plagiarism by identifying the sources. Secondly, it helps the writers to support their assertions and arguments. Finally, it helps readers to look for sources used in the paper and can find more information on the subject. Most scientific research is initially published in scientific journals and considered to be a primary source. Technical reports for minor research results and engineering and design work (including computer software) comprise much of the scholarship. Secondary sources in the sciences include articles in review journals (which provide a synthesis of research articles on a topic to highlight advances and new lines of research), and books for large projects, broad arguments, or compilations of articles. Tertiary sources might include encyclopedias and similar works intended for broad public consumption. Many fields in the applied sciences make partial exceptions to scientific publication practices, particularly in computer science research where scholarship can be presented and produced in academic conferences. Reasons for this departure include the large number of conferences, quick pace of research progress, and computer science professional society support for the distribution and archiving of conference proceedings. Publishing in the humanities is in principle similar to publishing elsewhere in the academy where a range of journals, from general to extremely specialized, are available, and university presses print many new humanities books every year. Scholarly publishing requirements in the humanities (as well as some social sciences) are currently a subject of significant controversy within the academy. In many fields, such as literature and history, several published articles are typically required for a first tenure-track job, and a published or forthcoming book is now often required before tenure. Some critics complain that this de facto system has emerged without thought to its consequences; they claim that the predictable result is the publication of much shoddy work, as well as unreasonable demands on the already limited research time of young scholars. To make matters worse, the circulation of many humanities journals in the 1990s declined to almost untenable levels, as many libraries cancelled subscriptions, leaving fewer peer-reviewed outlets for publication. In addition, many humanities professors' first books sell only a few hundred copies, which often does not pay for the cost of their printing. Some scholars have called for a "publication subvention" of a few thousand dollars to be associated with each graduate student fellowship or new tenure-track hire in order to alleviate the financial pressure on journals. In academic publishing, a "publication subvention" is guaranteed funding towards a partial subsidy of a scholar's publication in book form. The idea has recently been proposed as a possible solution to the "crisis," as some identify it, associated with the difficulty of publishing scholarly books that has emerged from the combination of small audiences (with many academic-press books losing money on their publication, and even good sellers profiting publishers only in the thousands of dollars) and high demands (with a published book typically required for tenure in many fields). Typical proposals call for a publication subvention of a few thousand dollars to be associated with each new faculty job, or even with each admitted Ph.D. student, by the sponsoring institution, in order to alleviate the financial strain on the academic presses' finances and allow them to choose works for publication based purely on merit. The rival to this subscription model is the open access journal model. (This is also known as "author-pays" or "paid on behalf of the author." ) where a publication charge is paid by the author, his university, or the agency which provides his research grant. The online distribution of individual articles and academic journals then takes place without charge to readers and libraries. Committing to the open access community means dispensing with the financial, technical, and legal barriers that have been designed to limit access to academic materials to paying customers. The Public Library of Science and BioMed Central are prominent and successful examples of this model. Corporate interests often criticize the principle of open access on quality grounds, as the desire to obtain publishing fees would cause the journal to relax the standard of peer review. It is often criticized on financial grounds as well, because the necessary publication fees have proven to be higher than originally estimated. Open access advocates generally reply that because open access is as much based on peer reviewing as traditional publishing, the quality should be the same (recognizing that both traditional and open access journals have a range of quality). It has been argued that good science done by academic institutions who cannot afford to pay for open access might not get published at all, but most open access journals permit the waiver of the fee for financial hardship or authors in underdeveloped countries. By October 2006, it has become clear that open access journals are feasible in at least some situations, and some can be financially viable without outside funding. It remains unclear whether this is applicable to all—or even most—journals. A variant of this model, Hybrid open access publishing has developed since 2004. In this system, those articles that have a fee paid are made available open access immediately; the others are either made available after a delay, or remain available only by subscription. During 2004, many of the traditional publishers (including Blackwell Publishing , Oxford University Press, Springer Science+Business Media and Wharton School Publishing) introduced such models, and the move is continuing to spread. Proponents of open access suggest that such moves by corporate publishers illustrate that open access, or a mix of open access and traditional publishing can be financially viable, and evidence to that effect is emerging. It remains unclear whether this is practical in fields outside the sciences, where there is much less availability of outside funding. In 2006, several funding agencies, including the Wellcome Trust in the UK and several divisions of the Research Councils UK (UKRC) announced the availability of extra funding to their grantees for such publication fees. ↑ History of Philosophical Transactions, The Royal Society. Retrieved April 10, 2018. ↑ Jonathan Grudin, "Why CHI Fragmented", CHI '05 extended abstracts on Human factors in computing systems (Portland, Oregon: ACM Press, 2005), 1083-1084. Retrieved April 10, 2018. Björk, B-C. "A model of scientific communication as a global distributed information system." Information Research, 12(2) (2007): paper 307. Retrieved April 20, 2018. Create Change Developed by the Association of Research Libraries and SPARC (Scholarly Publishing and Academic Resources Coalition) and is supported by the Association of College and Research Libraries. This page was last modified on 20 April 2018, at 15:13.